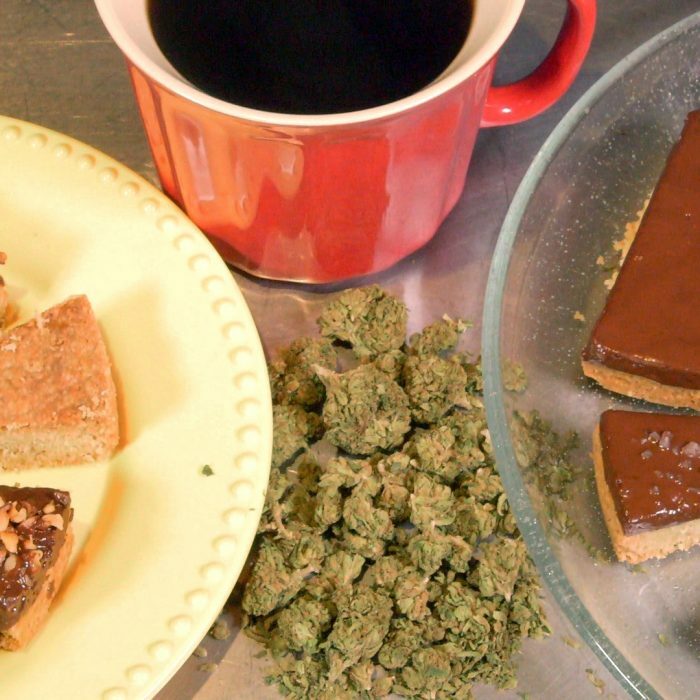 Classic Marijuana Brownies are made with cannabutter infused with a little bit of a twist to produce a deliciously refined gooey marijuana brownies recipe that will tease your taste buds and your brain. 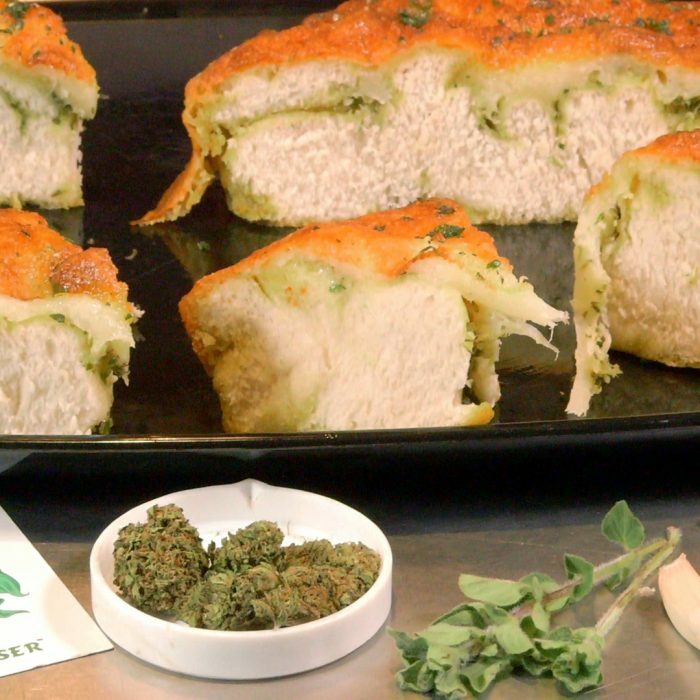 Make a sachet with cheesecloth for the marijuana and tie it off securely. 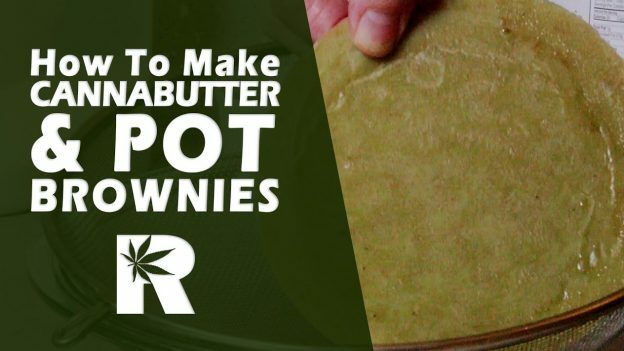 Melt butter in double boiler add 1 cup water and the sachet of marijuana. Keep heat high and water filled in boiler for [timer length=120]2 Hours[/timer] turning the sachet in the hot butter. Put filtered marijuana in container in refrigerator for about 1 hour until butter oil has solidified on top of the water, sediment and milk solids. Strain water off of the canna butter carefully. Melt cannabutter in medium saucepan over medium heat. Preheat to 325°F. Line 8 x 8 x 2-inch metal baking pan with foil, pressing foil firmly against pan sides and leaving 2-inch overhang. Coat foil with nonstick spray. Once butter is melted and hot, remove from heat; immediately add sugar, cocoa, 2 teaspoons water, vanilla, and 1⁄4 teaspoon salt. Stir to blend. Let cool 5 minutes (mixture will still be hot). Add eggs to hot mixture 1 at a time, beating vigorously to blend after each addition. When mixture looks thick and shiny, add flour and stir until blended. Stir in nuts. Bake brownies until toothpick inserted into center comes out almost clean, about [timer length=30]30 Minutes[/timer] minutes. Cool in pan on rack. Using foil, lift brownies from pan. Cut into 4 strips. Cut each strip crosswise into 3 brownies for 12 servings. Keep heat high and water filled in boiler for 2 Hours turning the sachet in the hot butter. Bake brownies until toothpick inserted into center comes out almost clean, about 30 Minutes minutes. The Classic Pot Brownie Recipe with a little twist in the butter infusion. 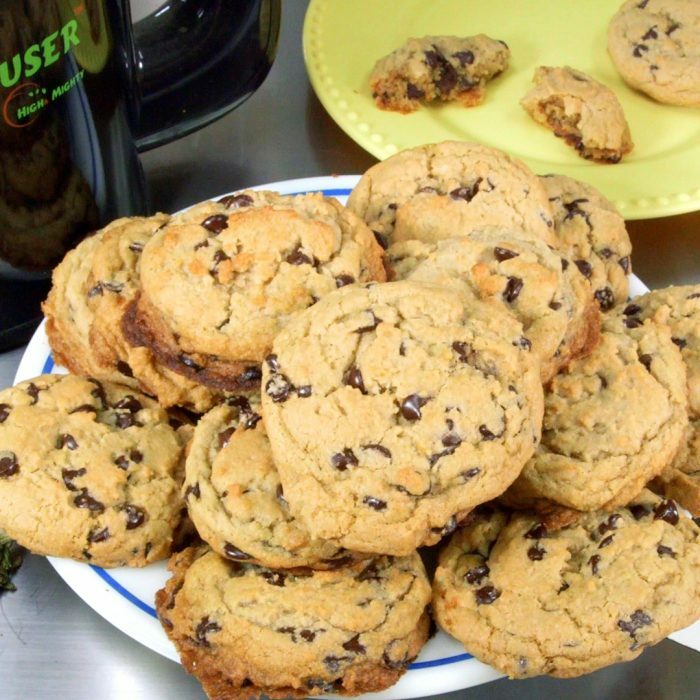 Making these right now. Using the glass bowl we warmed the butter in. Added ground pistachios, espresso, and coconut flakes on top. Thanks for the recipe. Can’t wait. I used only a 2 year supply of twigs and a gram of fresh grinds. Didn’t get a green butter but it smells really yummy. My butter took 4 hours to cool down. Yeah but how much butter do you actually use? Great recipe, although I did not use the sachet. I put the shake directly into the butter to infuse it. I love what you guys are doing, keep up the good work!!! 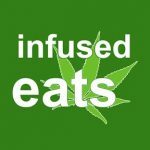 Did you decarb the marijuana ? ?